There’s a good reason that golf’s most famous adage is “drive for show, putt for dough”: the putter is by far the most-used club in your bag. It’s the one club that can salvage a bad round or ruin a good one all by itself. The legendary Harvey Penick said the three most important clubs in your bag are the putter, driver and wedge – in that order. The best way for you to improve your scores as a beginner is to eliminate three-putts and increase your one-putt frequency. While the best way to get better at putting is through lessons and practice, you have to start with a putter that you can aim at your target line and control the distance of the putt with. This article will help you find that perfect putter. This putter produced the best alignment of any of the putters reviewed. The tried and true design alongside new tech such as the White Hot Insert for improved sound & feel, will make it super easy for beginners to truly master their putts. 5.1 Should I use a mallet or a blade? 5.2 Should I use an offset putter? 5.3 What type of grip should I use? 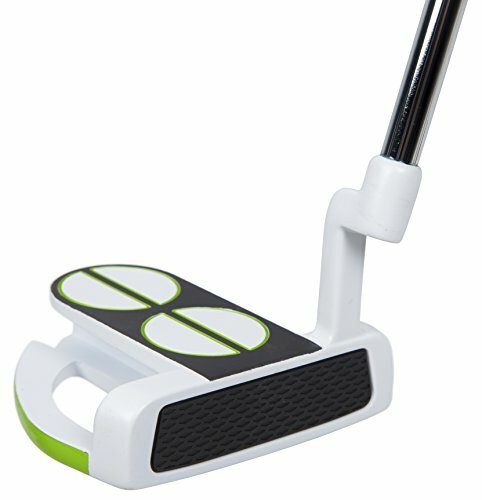 The Odyssey White Hot 2.0 line of putters is made up of several classic designs with Odyssey’s iconic White Hot insert. As Callaway’s putter-specific brand, Odyssey has enjoyed several decades as possibly golf’s most popular putter maker amongst pros and amateurs alike. The White Hot insert that Odyssey is known for has been re-engineered to improve its sound and feel, and you can’t ask for a better “click” at impact. The classic blade offset style is presented here as the #1 model. This one has very minimal markings: just a small alignment line right behind the ball. It’s for players who have a pretty significant arc to their putting stroke, or who have trouble getting the clubface squared at impact. There’s a fairly significant toe-hang here to help get the clubface squared and released through the putting stroke. The heel-toe weighting provides a sizeable sweet spot but not much forgiveness if you miss the sweet spot. My other favorite one of this line is the Rossie putter. It’s one that I used when it was first released and still have a soft spot for. Brandt Snedeker is one of the best putters in the world and he’s used the same Odyssey Rossie putter for ages. The combination of how it sits behind the ball and the visually appealing alignment lines make for a confidence-inspiring experience. I wouldn’t recommend the heel-shafted #9 model as the weighting of it feels a bit weird, and heel-shafted putters are notorious for being tough to square to the target. A quick-tempo stroke will leave the club face open, whereas it will over-rotate and cause a pull if you have a slower tempo. The Odyssey White Hot was one of the first putters made with an insert like this, and golfers tend to love it or hate it. Proponents say that it feels softer and better than solid metal putters, whereas detractors contend that it doesn’t sound right and doesn’t offer the feel of a milled steel putter. Odyssey has tried to address these concerns with the White Hot 2.0 and to their credit, it sounds great. It’s what a putter should sound like – a distinctive click. You know it when you’ve hit a good one, and it tells you when you haven’t. I think it’s a home run that should please the most dedicated milled putter fans. SeeMore is a putter company that flies under the radar, despite being the putter of choice for major championship winners Zach Johnson and Payne Stewart. It’s a foolproof way to get the putter face pointed in the right direction, and one that I think most golfers would benefit from. The patented system that distinguishes SeeMore from other manufacturers is their RifleScope Technology, or RST. The concept behind it is simple, but brilliant. The bottom of the putter shaft (or the entire shaft, if you prefer), is painted black. On the top of the putter behind the shaft is a large red dot flanked by two white lines. When you place the putter behind the ball, the black part of the shaft should hide the red dot, and you should be able to see the two white lines perfectly. If you can see the red dot or if the lines are hidden at all, the club face isn’t square to the target line. I found SeeMore’s RST system incredibly effective, especially in the crucial 3-8 foot range. These putts are short enough that you should make most of them but long enough that a slight mis-alignment can result in a missed putt. The RST system gave that extra boost of confidence that the ball would start rolling in the right direction. Many golfers like to use a forward press when putting. Jordan Spieth and Phil Mickelson both have noticeable forward presses and use it with great effectiveness as a trigger for their stroke. A forward press is when you move your hands slightly forward before starting your stroke. If you’re a forward presser, the SeeMore FGP with its straight, center-shafted design might cause you some issues. Once you align the putter with the RST system, a forward press may throw that alignment off immediately. Suddenly you’ll see a bit of the forbidden red dot and your clubface will likely open. One of the unsung aspects of SeeMore FGP putters is that they’re face-balanced at impact; that is, they’re weighted so that when the putter is held in a normal grip, the face naturally balances square to the target line. 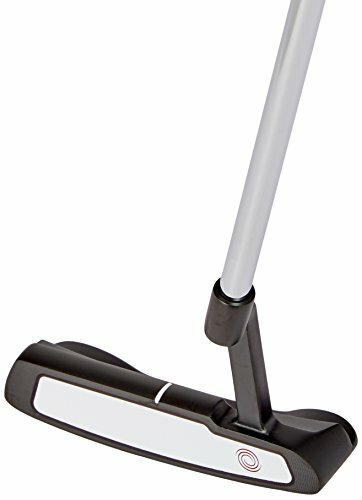 It’s a feature you don’t find in toe-hang or traditional “face-balanced” putters, and I found it really helped to get the clubface square at both address and impact. Together with the high MOI of the putter, I found the face-balancing and RST to produce the best alignment and highest number of made putts of any of the putters I reviewed. The Pinemeadow PGX putter may grab your attention for looking a lot like some popular TaylorMade or Ping putters that it’s modeled after. And at a price under $50, it’s awfully tempting! However, I found a few major flaws that actively detracted from the performance. If you’re looking for a budget option that actually performs and can’t afford to spend more than $50, then you should consider the Pinemeadow Golf Mens PGX Putter. The first thing I noticed right off the bat was that when I took my usual putting grip and stance, the putterface looked closed. While I didn’t see too much effect on short putts, when I got outside of 10 feet I confirmed it: the grip wasn’t aligned properly to the club face. Sure, this can be corrected by buying a new grip, but once you’ve paid for a new putter grip and installation, you’ve added at least $20 to the price of the club. Being budget conscious shouldn’t mean getting a product that will actively inhibit the ultimate goal of making putts and shooting better scores. The reason I could tell right away that the clubface was closed is because the alignment lines are very precise and well-defined. So by adjusting my grip, I was able to properly aim the putter, but this isn’t something you should have to do. The putter should nestle into your hands and point where you’re looking right out of the box. The insert did have a decent feel on some rolls. But that’s as much good as I can say about it. I took four balls and made what I felt like were four nearly identical strokes to a target twelve feet away. Any other putter would’ve rolled the four balls within a few inches of each other. But the Pinemeadow PGX had over two feet of distance dispersion and nearly 10 inches of directional dispersion. If you’re making consistent strokes but the putter is sending the ball all over the place, there’s a basic lack of quality control that means you should look elsewhere. With a preponderance of quality putters hovering around the $100 range, it’s worth it to spend a little bit more and get a putter that won’t actively inhibit making putts. EVNROLL is a relatively new company, founded in 2015, but the man behind the designs is well-known in the golf world. Guerin Rife is a renowned putter designer who’s been making putters under the brand Rife for many years. But in 2015, he decided that his new groove technology was so revolutionary that it needed to be its own brand, and EVNROLL was born. 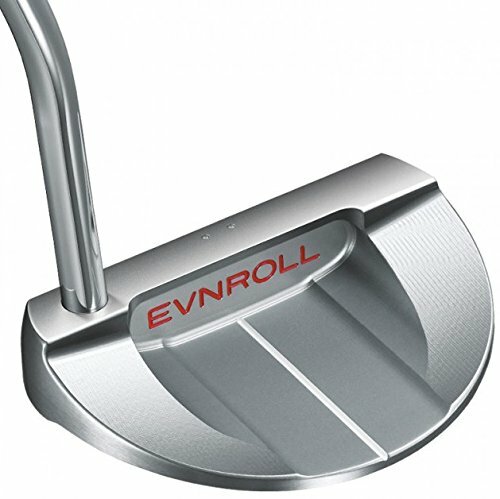 EVNROLL grooves are designed to create the largest sweet spot of any putter on the market. The grooves are widest in the center of the putter, and taper to a narrower, shallower groove as they extend out to the heel and toe. The variation in depth and width of the grooves imparts sidespin on mis-hit balls so they actually curve back towards the target line when a normal putter would send them offline. If you hit this putter on a flat surface you can actually see this happen: intentionally hit a ball off the toe and it’ll curve slightly right to left and still find the cup more often than not. This putterhead is a beefy one. Crafted from 303 stainless steel, it’s a rock-solid piece of metal with a noticeable presence to it. The feel was good but not great, firm but almost a little dead feeling. That could be a result of the deeper center grooves, but it took some adjusting to. When I first started rolling putts it seemed like everything came up short. The weight of the head and slightly deadened feel was nice on slick greens, where just a tap in the right direction is all you need to get the ball to the hole. But on slower greens (such as you might find on busy public courses that beginners frequent), I found hit hard to hit the ball with enough speed to get all the way to the hole. On long putts outside of 30 feet, it was difficult to just nestle the ball close to the hole for an easy two-putt. I found myself having to overcompensate and make sure I hit it harder than what felt natural. Sometimes I’d overdo it and find myself knocking the ball 10-15 feet by. I imagine this is an issue that would correct itself with practice over time, but make sure you’re prepared for a little bit of a learning curve on lag putts if you buy an EVNROLL ER8 Tour Mallet putter. However, its exceptional performance on putts inside 8 feet more than makes up for this in my book. 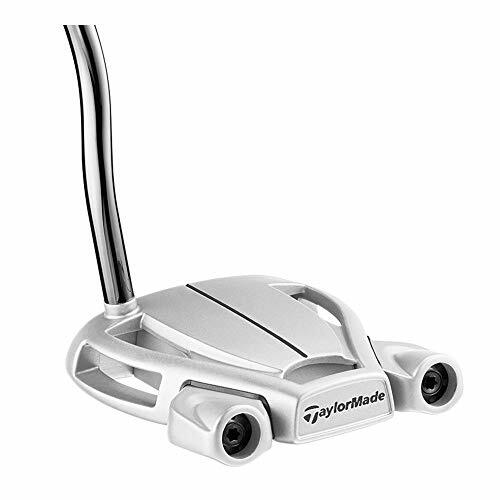 The TaylorMade Spider has been the hottest putter on the PGA Tour for several years now. Sergio Garcia won the Masters with it, Jon Rahm cracked the top 5 in the world with it, Dustin Johnson used it to win multiple events in a row, and even Charles Howell III broke his 11-year winless drought with a Spider. But that doesn’t mean that it’s a putter specifically made for the best players in the world; in fact, there’s a lot here for beginner and intermediate players to like. For the 2018 Spider, TaylorMade has tweaked the geometry and weighting of the putter head to increase the MOI and make it even more forgiving than last year’s model. The body of the putter is a lightweight aluminum, while the outer ring is a heavier stainless steel. This extends the weight to the heel and toe of the club, making the sweet spot nice and large. The arc structure of the geometry winds up creating three sight lines: one obvious one in the crown of the club and two implied ones at the edges of the golf ball. This makes addressing the ball a breeze and makes it look like the putter has engines ready to drive the ball straight at the hole. I felt very confident standing over each putt. Surlyn is a material known best to golfers as the ionomer used as the cover for distance balls like Pinnacles and Top-Flites. TaylorMade has taken that Surlyn material and crafted an insert out of it, so the feel of the putter is closer to two golf balls striking each other rather than a metal surface striking a softer golf ball. The result is a springy effect that fires the ball off the clubface, but I found the ball had a tendency to bounce a little bit before really starting its roll. It even had a bit of backspin on longer putts when a harder strike was required. If you’re used to a solid piece of metal, the Surlyn insert will feel pillowy soft and will take some getting used to. I actually came to like it, as it encouraged a confident, aggressive stroke. The “Interactive” version of the Spider comes with an insert in the grip that will record data about your strokes. You can then download that data to your computer and use it to help guide your practice. I didn’t test this aspect of the putter out, but for you gearheads out there, it’s sure to provide some interesting feedback. I expect we’ll see a lot more of this type of thing in years to come. Cleveland is a company known more for their wedges than their putters, but their 2135 Satin Elevado putter might change that. With a number of clever innovations and a gloriously soft milled face, the face-balanced Elevado is one of the better-feeling and performing putters of my tests this year. It was one of the easiest putters to use. It looks similar to the much more expensive Scotty Cameron Futura putter that Justin Thomas has used to much success, but in my opinion it actually outperforms the Futura. You may look at the name of the Cleveland 2135 Elevado and think that the number 2135 is there just because it sounds cool or something, but it’s actually based on a very interesting design concept. The sightline that rests behind the ball on a normal putter like this would be at the bottom of the putter, essentially at ground-level. However, Cleveland realized that the intent is to strike the middle of the golf ball, which lies 21.35 mm off the ground. So Cleveland raised the sightline 21.35mm off the ground, matching the exact radius of a golf ball, so the line you see behind the ball is closer to the line that you’re actually hitting the putt on. If you’re tired of the standard alignment lines, this is a system that you might find works better for you. 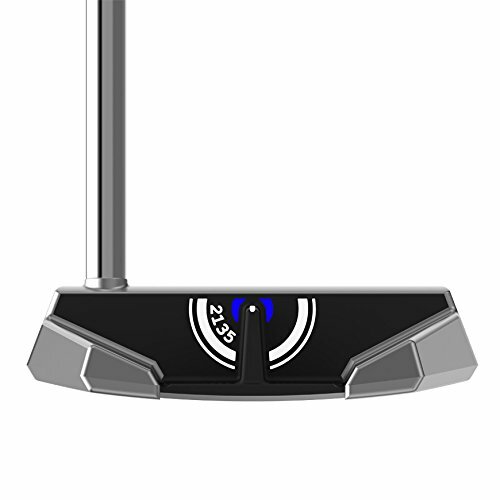 Face balanced putters are putters whose face points straight up at the sky when you hold them parallel to the ground, and they’re generally recommended for golfers who have a very minor arc in their putting strokes. Generally, face-balanced putters have fairly high MOI, which helps make up for mis-hit putts but can sometimes make distance control tough. Another good thing about the 2135 Elevado from Cleveland is that it’s one of the softest feeling putters I tested. A lot of mallet putters swing like a pendulum but don’t have that softness. The Elevado achieves it with its distinctive milling and an insert behind the face that makes it pillow-soft at impact. I liked it, but if you want a bit of “hit” in your putter, I’d look elsewhere. 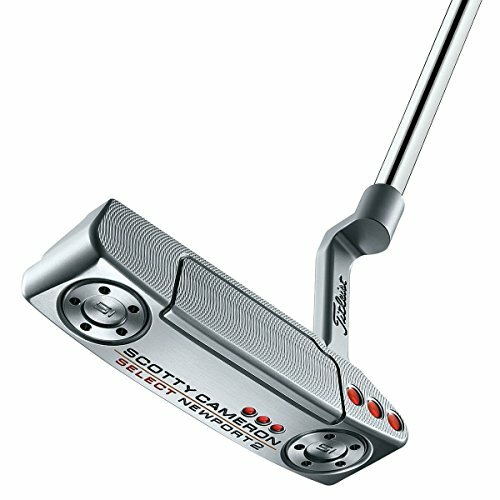 Scotty Cameron putters are some of the most iconic and beloved putters in the world. From his classic designs, like this Newport 2, to the experimental Futura line of putters, Scotty Cameron has been the biggest name in the putter world for three decades. When they first came out, they were the first putters I’d seen that topped the $200 price range, and they still command a pretty penny at the cash register. But boy are these Scotty Cameron putters pretty. The craftsmanship is apparent, from the grip to the putter head to the headcover: everything is just tip-top quality. The milling is beautiful and precise, and the ball rolls awfully nicely off the putter face. I was a little surprised at how hard the putter felt; historically Scotty Cameron putters have been as buttery soft as you can find amongst metal putters. This 2018 Newport 2 with its face inlay feels firmer, which I found curious as you’d expect the inlay to soften the feel. As pretty as this putter is, I’d steer a beginner away from it. 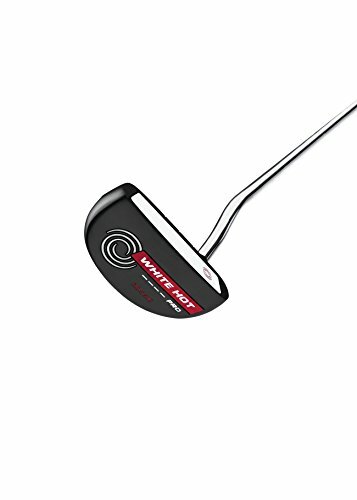 It feels great and the heel to toe weighting design does offer decent forgiveness, but the moment of inertia is low and it’s not the most forgiving putter. If you spend this much on a putter and then miss a few makeable putts, you might lose your confidence in the putter but feel like you’ve spent so much that it has to stay in the bag. For beginners, I’d suggest a putter with more forgiveness and a higher moment of inertia to help keep putts on line a little better. Once you’ve developed a good feel for the greens and you’re hitting the sweet spot consistently, you might then consider making the investment in a Scotty Cameron putter. Most beginners would be better-served getting a nice, quality $100 putter and spending the rest on a few lessons. They’ll cut more strokes off your game than a good-looking putter ever will. The Tour Edge HP (which stands for High Performance) Series 10 putter is, to be frank, a clone of the uber-popular TaylorMade Spider line of putters. But with prices ranging from $200-400, the TaylorMade Spiders might not be a realistic option for a lot of golfers. That’s why the Tour Edge is a refreshing option: despite a few shortcomings, it provides consistent performance at a price that’s hard to beat. I love the alignment system on the Tour Edge HP Series 10 putter. While some players may find it overly busy, I felt it gave a great visual that encouraged a good, confident stroke and resulted in an increase in sweet spot contact. The ball-shaped curve at the end of the alignment lines gives the impression of a smooth stroke, pushing you to simply send the ball on its way rather than hitting at it. One of the main issues I see in beginners is that they either take the club back too far and then decelerate, or they don’t take it back far enough and they hit at the ball. A good putting stroke is one that maintains speed without hitting at the ball — the putter should stroke through the ball and just get it rolling on its way. 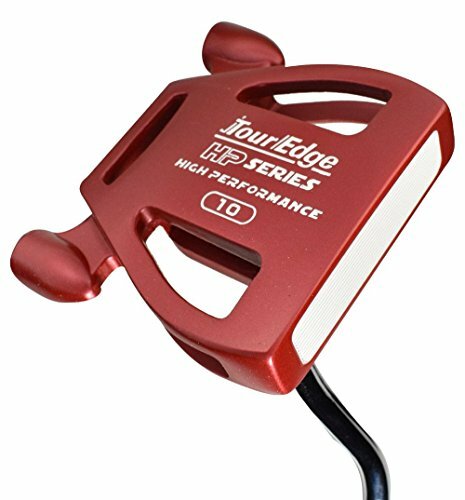 This Tour Edge putter helps encourage that with its Spider-style weights and effective markings. You’re not sacrificing performance with this putter, as it rolls the ball nicely and has good solid feel off the micro-grooved face insert. However, you can see why it’s priced much lower than most of the other putters on the list. The paint job is cheap-looking and chips easily. You’ll definitely want to use the headcover all the time as even normal use nicked the putter up. The welds of the body to the clubface are also quite noticeable; in more expensive putters they’re either much more subtly done, or the putter is milled from a single piece of metal. At this price point, though, you have to expect the company to cut a few corners. I’m glad they sacrificed aesthetics and not performance, because nothing looks better than a ball going into the hole. The TaylorMade TP Ardmore 3 putter is one of the most interesting putters I tested this year, thanks to its dramatic color scheme and stark alignment line system. 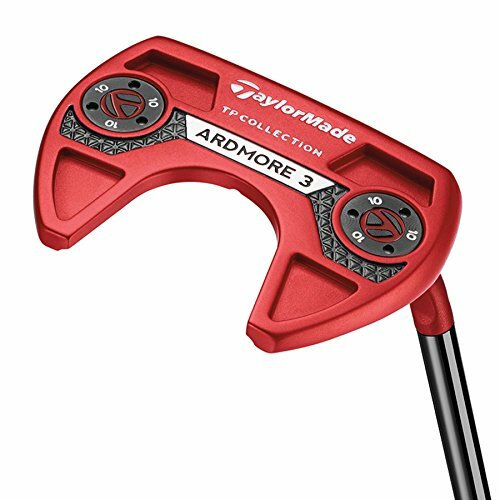 TaylorMade tour pros have seen great success with their red putters since Jason Day started using one several years ago, so they’ve expanded the line to include this Ardmore 3. However, it’s not a solid red like most of the others – the dramatic white/black alignment area is a unique look. 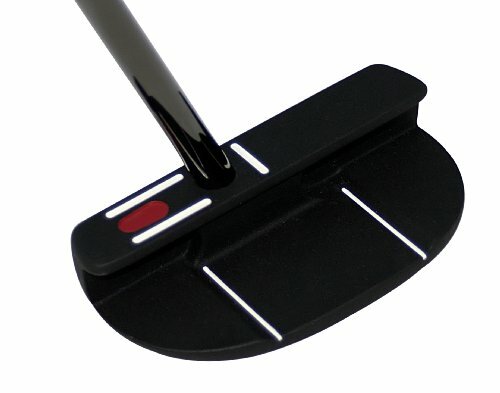 I think the putter would look great if it was a solid red with the prominent black alignment line resting behind the ball. But TaylorMade is always known for experimenting and delivering innovation, so they’ve made the area directly behind the ball a stark, bright white. This makes the black alignment line really pop out to your eye, but I actually found that it distracted me just a little bit. When I’m standing over a putt, I want to set the putter down behind the ball and then focus on the hole. I try to get a good picture of the ball entering the hole, then look back down and make a good stroke. When I looked back from the hole to the ball with the Ardmore 3, I’d find myself focusing on the putter rather than the ball. That led to some head movement during the stroke, as I’d watch the putter go back instead of keeping my head down. Your mileage may vary, of course. TaylorMade wouldn’t have put this putter on the market if they hadn’t tested it extensively and successfully, so clearly there are golfers out there who found the distinctive color pattern useful and not distracting. And I have to say, their TrueRoll insert feels great. Not to mention the excellent MOI and forgiveness of the Ardmore 3 design – the extreme heel and toe weighting makes virtually the entire face a sweet spot. But I tended to close the clubface a little before even starting my stroke, and coupled with the involuntary head movement, I didn’t make a whole lot of putts with the Ardmore 3. Guerin Rife, the man behind the EVNROLL putter reviewed earlier in this article, made his bones earlier in his career with the Rife brand. This Two Bar design is uniquely his, and is a tough one to review because it’s for a very narrow subset of players. If you’ve never tested which of your eyes is dominant, it’s a good idea to do so prior to buying a putter. There are a number of different ways to do so, but the quickest way I’ve found is outlined here. In my experience, most golfers’ dominant eye is the same as their hand. This is why offset putters are so popular – the trailing eye is the main one visualizing the putt, so it makes sense to have the putter strike the ball under the dominant eye. However, if you’re a right-handed golfer with a dominant left eye, an offset putter is likely to cause issues hitting the putt where you’re looking. The answer to having your lead eye dominant is to get a putter that’ll send the ball on the line that you’re seeing. 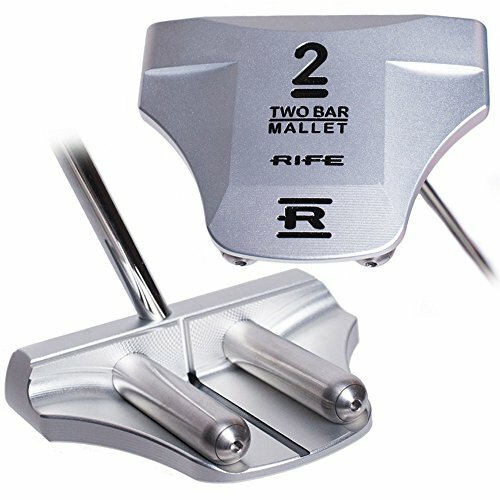 This Rife Two Bar putter has a center shaft (meaning the shaft enters the clubhead closer to the middle than the traditional heel placement) and no offset. This should help you square the club at impact and make the path of the ball follow what you’ve envisioned. What’s with the two bars? There are two aspects to the Two Bar putter that makes it such a clever design. First, they act as alignment aids, both pointing down the target line and clearly defining the sweet spot of the putter. Second, they act as removable weights. Traditional wisdom holds that you should use a heavier putter on faster greens, and a lighter putter on slow greens. So having removable weights to fine tune the putter to the green speed makes a lot of sense if you’re playing at a variety of different courses with green speeds all over the map. And there are some days where the putter just doesn’t feel right. Rather than running out and buying a new putter (as many golfers I know would do), you can just swap the weights out and get a whole new feel. That’s a lot easier on your pocketbook! The way a putter sits behind the ball and sets up to the target line is of paramount importance when judging the effectiveness of a putter. There are numerous different alignment lines/dots/aids, all of which are designed with one thing in mind: hit the ball in the right direction. Some golfers want minimal alignment aids, whereas others need big long lines or prefer a unique system like a 2-ball putter or a SeeMore offers. My judgment on looks is based on first impressions: how it looks when you pick it up, how it looks when you set it down behind the ball, how well it helps you focus on the target line, and the craftmanship involved in making the putter. Feel might be the hardest element of putting to define. There are numerous different inserts and metals used in putters to offer golfers a wildly diverse array of feels at impact. And on top of that, the type of ball you choose to use can affect feel as well! A rock hard distance ball like a Top Flite will feel quite different from a soft, high-compression ball like a Wilson Staff Duo. For these tests, I used the most popular ball on the PGA Tour, a ball that actually suits a wide cross-section of players: the Titleist ProV1x. The combination of distance, feel and spin offered by the ProV1x is the reason why it revolutionized the golf world upon its introduction and makes it a great ball to test putters with. An often-overlooked element of feel is sound, so I’ve incorporated sound into this feel rating. I’ve used putters that made a lot of putts but had such an offputting sound that I had to take them out of play. One of the most important features of a putter is its ability to get the ball rolling quickly. This may seem like an obvious statement, but you’d be surprised at how many putters cause the ball to skid or hop before it finally starts rolling properly. These initial skids and hops can wreak havoc both on the accuracy and speed of the putt. The goal is to get the ball rolling smoothly as soon as possible because a rolling ball carries a good amount of inertia and is less likely to be affected by the grain and impurities of the green. If the ball is skidding, bouncing, or just not rolling smoothly, it’s more likely to be knocked offline or come up short of the hole. You’d think that a putting stroke should be an easy, short, repeatable motion that results in sweet spot contact every time. The putter only moves a few inches back and through, right? Well, it’s a whole lot more complicated than that. Even the best, smoothest putting strokes in the world produce mis-hits. And in a game where the target is a mere 4.25” in diameter, precision is the name of the game. So we’re looking for putters that will produce good results no matter where on the face the putt is struck. If you hit a sweet spot with one stroke and then miss it with the next, ideally you’d still like both putts to roll the same distance and along the same line. A putter with poor forgiveness will leave mis-hits woefully short or bending offline. A higher level of forgiveness equals more putts made, especially in high-pressure situations when your stroke might get a little wobbly or tentative. The last criteria here is value. Many beginner and intermediate golfers are just getting into the game and need to upgrade their whole bag. While it’s tempting to spend $600 on a driver and $400 on a putter, is it really worth it? Scotty Cameron putters may be ubiquitous on tour, but can a $100 putter get the job done and still leave you with enough left over for a lesson or two? With greens fees increasing every year, it’s important to spend your dollars wisely. If you’re playing for big money, maybe it’s worth it to splurge on a putter. But what if there’s a putter out there that fits your needs for a much lower price? Or you may be the type of player who changes putters constantly. You’ve got one in your bag and ten in your garage. The putter that couldn’t miss yesterday suddenly stops working, so you hop online and buy yourself a new weapon for the greens. Either way, you’re looking for a great bang for your buck! I’ve put in the time to make sure you’re getting your money’s worth. Should I use a mallet or a blade? The two most common putter head styles are the mallet and the blade. The blade is typically a small, narrow head with minimal alignment aids and a heavy toe. Blade putters are generally used by better golfers and players with a pronounced arc to their strokes. Blades are best suited to players who have quiet hands and hit the middle of the putter face most of the time. Mallet putters have much larger heads and usually larger sweet spots. They’re also engineered to have a high moment-of-inertia, which is the putter’s tendency to resist twisting on impact. This high MOI generally means that mis-hit putts will still start out on line and the ball will still roll out a similar distance as a perfectly struck putt. Mallet putters are generally considered more suited to players with straight-back-straight-through strokes or strokes with minimal arcs. 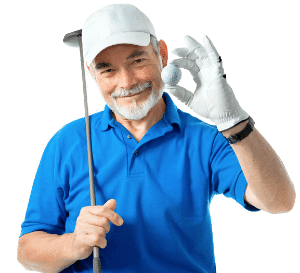 They’re increasing in popularity amongst all levels of golfer including on the PGA Tour thanks to their forgiveness and tendency to get the ball rolling on line. Should I use an offset putter? An offset putter is one in which either the hosel is set back from where the shaft enters it, or the shaft is bent so that the putter head sits behind the grip of the shaft. A straight shafted putter, on the other hand, is just what it sounds like: the shaft goes straight into the putter and the putter face is lined up with the shaft. Traditional wisdom holds that eye dominance should dictate whether you need an offset putter. If your lead eye is dominant (left eye for right handed golfers), then you should go with a straight-shafted putter. If it’s your trailing eye, look for a half or full offset. This doesn’t hold true for everyone, though! I’ve found that for many golfers, any amount of offset will cause them to aim the putter face to the right of the target. Many golfers see Tiger Woods, Steve Stricker and other top putters using an offset putter and thus assume that they should too, but I suggest you try out a straight shafted putter too — especially if you miss a lot of putts to the right side of the hole. What type of grip should I use? This wasn’t a question when I was younger: basically all putters came with some variation of the iconic Ping PP58 grip: a skinny, flat-topped grip that got a little thicker at the top of the shaft. But these days there are as many different grips as there are putter head styles: slim, fatso, mid-slim, pistol, square, super-fat, mid-fat, and so on! So what’s the right grip for you? If you’re a player who likes to use your hands or uses a short, poppy stroke a la Brandt Snedeker, you’ll likely want to stick to a slimmer grip. But most beginners are actually better served to remove their hand action from their stroke. It should be more of a pendulum from the shoulders with little-to-no hand and wrist action. Many of the new fatter grips will help you do this. If you find yourself pushing and pulling putts with equal frequency, trying out a midsize or jumbo grip could be just the thing to get your putts rolling straighter. Personally, I find that the fatter grips prevent me from closing the clubface, so I push all my putts with them. But a nice midsize grip quiets my hands while still getting my putts on line. Overall, I’d say if you miss all your putts to the right, try a slimmer grip. If your putts go all over the place, try a fatter grip.